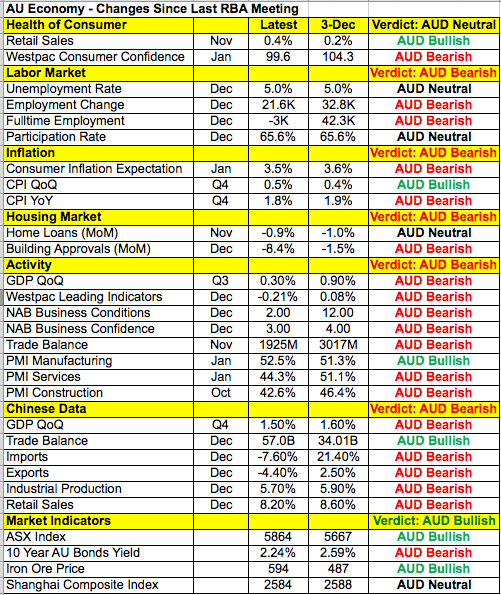 RBA Preview - Should A$ Traders Be Worried? With many traders in Asia off for the Lunar New Year holiday, it has been a quiet day in the forex market.The greenback extended its gains against all of the major currencies as equities continued to rise. The Dow Jones Industrial Average rose another 175 points bringing the total year to date gain to 8.2%. There's not much in the way of US data this week to threaten the dollar's recovery. Investors ignored the unexpected drop in factory orders and weaker durable goods orders growth in November. This week's flows will be driven by the outlook of other central banks and the trend of growth abroad. We know that the Federal Reserve is worried that the US economy will lose further momentum in the first half of the year so they see no reason to rush to raise interest rates again. Most other central banks are not in tightening cycles so their outlook will be either less or more hawkish. Unfortunately both the Reserve Bank of Australia, who meets tonight and the Bank of England who meets on Thursday have reasons to be concerned. We just learned that service sector activity in Australia contracted for the first time in nearly 2 years with the PMI index falling to its lowest level since November 2014.A$ traders should be worried because this slowdown comes amidst widespread deterioration in Australia's economy since their last meeting in December. Job growth is slowing, consumer confidence is falling, inflationary pressures are easing despite the recent increase and business activity / confidence are weakening. A large part of this has to do with lackluster growth in China and ongoing trade uncertainty. So even though a number of RBA officials have said that the next move in rates will be higher, for a central bank who expressed concerns about low household income growth and decline in asset prices at the end of last year, the outlook deteriorated further. For this reason, fresh caution from the RBA could take AUD/USD down to .7150. Euro and sterling also extended their slide against the greenback as both currencies look forward to another round of softer data.UK PMI services and composite indices are scheduled for release on Tuesday and the sharp drop in the manufacturing PMI index tells us that the economy is slowing. Even if it improves, we should see nothing more than a deadcat bounce in GBP because Brexit uncertainty keeps pressure on the currency. With less than 60 days before the March 29 deadline, we are no closer to a Brexit deal. Eurozone retail sales should also fall sharply after the steep pullback in spending in Germany and France in December. Despite the holidays, consumer spending in the EZ's largest economy fell by the largest amount in 11 years. Both currencies are vulnerable to further near term declines.